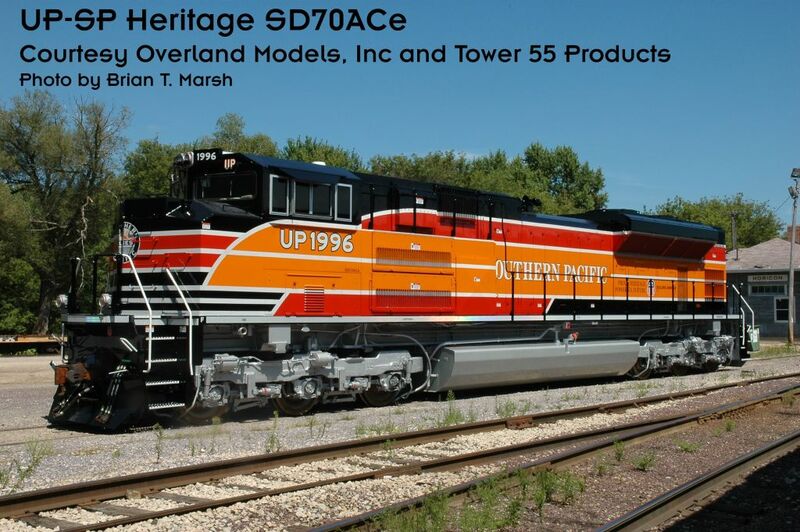 Dear Customers: Here are two Press Releases from UP and Overland Models I'm sure you will find interesting re the last of Union Pacific's Heritage SD70 Ace Fleet. Omaha, Neb., August 21, 2006 ? Another tribute to a great railroad is riding the rails. The latest addition to Union Pacific?s Heritage Series of locomotives, the Southern Pacific locomotive, was introduced Saturday during a special employee event in Roseville, Calif. 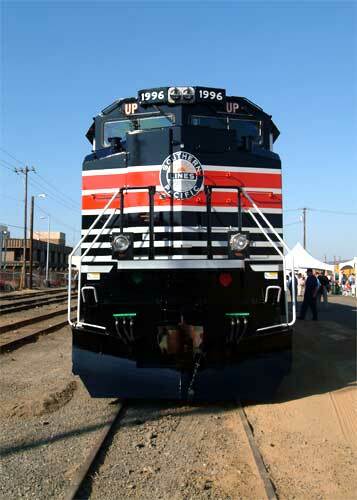 The new locomotive incorporates Southern Pacific?s historic colors and graphic elements to honor the men and women of the line affectionately known as the "Espee." "The railroads that are now a part of Union Pacific added more than track and territory, they also contributed the expertise and knowledge of the many people who worked for those great lines," said Bob Turner, senior vice president-Corporate Relations. "The creation of our Heritage Series is just one way we are honoring the generations of men and women who helped to build a great nation and the foundation for our future." The Southern Pacific joins the Chicago & North Western locomotive unveiled in July 2006, the Denver & Rio Grande Western rolled out in June 2006, the Katy locomotive introduced in September 2005, and the Missouri Pacific and Western Pacific locomotives unveiled in July 2005. All honor the people and the railroads that have made Union Pacific what it is today. Founded in 1865 by a group of businessmen in San Francisco, the Southern Pacific was created as a rail line from San Francisco to San Diego. Through the years the line expanded to more than 13,000 miles of rail covering most of the southwestern United States. Southern Pacific was noted for a number of firsts; including stewardship of its lands, unique cab-forward articulated steam locomotives, computers, development of the double-stack container car and corporate diversification. The emergence of truck transportation and other marketplace changes in the 1970s led to Southern Pacific?s decline. It merged with Union Pacific on Sept. 11, 1996. The Heritage Series marks the fifth time in company history that Union Pacific has painted locomotives in colors other than the traditional UP "Armour Yellow" paint scheme. Previously, locomotives were custom painted in 1991 to honor UP employees serving in the Persian Gulf War, in 1994 to call attention to the United Way Campaign, in 1996 for the Atlanta Games Olympic Torch Relay Train, and in 2002 for the Salt Lake City Games Olympic Torch Relay Train. 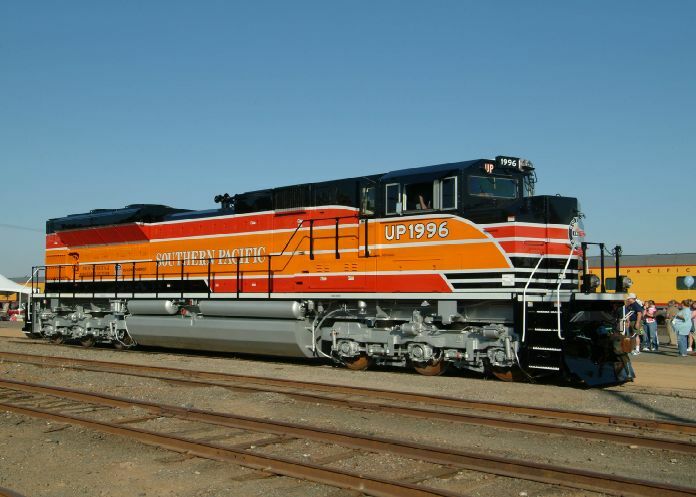 Please find below a photograph of the new UP-SP SD70ACe Heritage Series Locomotive. This is the last in a series of 6 locomotives. The locomotive (was) is to be unveiled this morning in Roseville CA at the Union Pacific rail yard. This locomotive will be offered in brass by Overland Models, Inc in N, HO and O scales. Tower 55 Products, our plastic Division will produce this model in both DC and DCC equipped variations. The DCC variants will come with DCC and Sound provided by Digitrax and their new SoundFx.